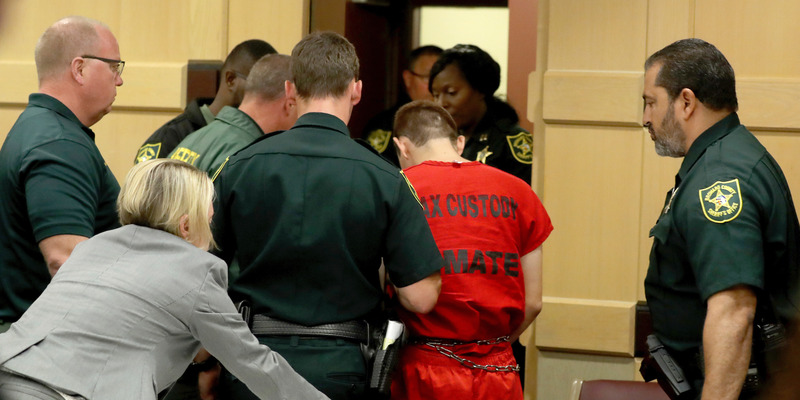 South Florida Sun-Sentinel/Mike Stocker via Associated PressNikolas Cruz leaves court after a status hearing before Broward Circuit Judge Elizabeth Scherer in Fort Lauderdale, Fla., Monday, Feb. 19, 2018. The accused Florida shooter withdrew his guilty plea on Thursday and instead “stands mute” to the charges. A grand jury indicted him on 34 counts of murder and attempted murder. Standing mute allows the defendant to avoid the spectacle of a not guilty plea while his attorneys prepare for a potential death-penalty trial. Accused Florida high-school shooter Nikolas Cruz withdrew his written not guilty plea and “stands mute” to 34 charges, Broward County court filings show. A grand jury indicted Cruz on Wednesday on 17 counts of first-degree murder and 17 of attempted first-degree murder in connection with the shooting. “A written plea of not guilty was filed in this cause prematurely before formal charges were filed,” a document filed Thursday said. It was signed by Cruz’s attorney Melisa McNeill. “Having now been Indicted by the Grand Jury, the Defendant Nikolas Cruz withdraws that filing and Stands Mute to the Charges,” it said. Standing mute has the same legal effect as pleading not guilty, but in Cruz’s case could be part of a legal strategy as his attorneys prepare for a potential death-penalty trial. His previous not guilty plea indicated that Cruz denied his alleged role in the shooting, even though the evidence against him is overwhelming and Cruz himself has confessed to authorities, they say. Standing mute, however, neither denies nor confirms the allegations, and allows his defence attorneys to proceed without appearing to disrespect the victims. Cruz has been held in the Broward County jail without bond since the February 14 massacre. He’s set to be formally arraigned on March 14. Cruz’s attorneys have previously said he intends to plead guilty if prosecutors agree to pursue a life sentence rather than the death penalty.